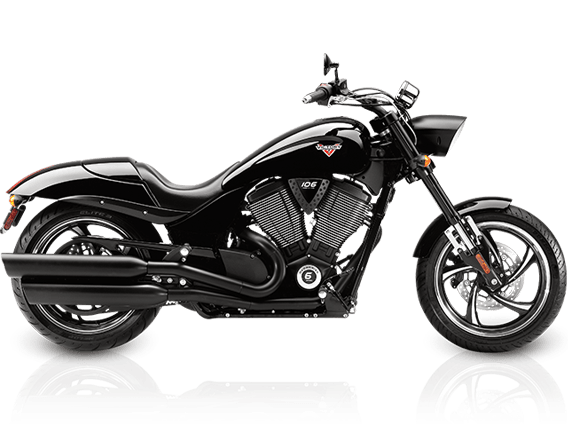 The Victory Hammer 8-Ball is an outstanding cruiser motorcycle that delivers a great riding experience, tremendous value and styling that could only come from Victory. The Hammer 8-Ball has blacked-out features from end to end, from the headlight to the exhaust. The blacked-out style is powerful and understated. It’s ready for a Hammer 8-Ball rider to customize and add accessories to make the bike your own. 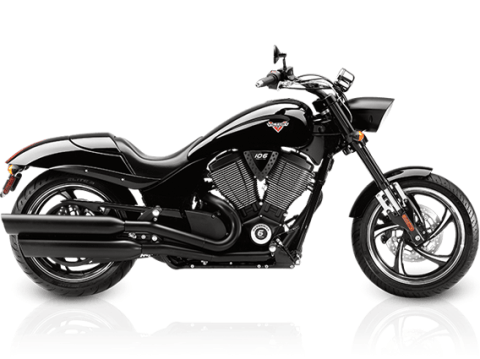 The Victory Freedom® 106/6 V-Twin is smooth, efficient – and extremely powerful. It’s fuel-injected, counter-balanced and it delivers 110 ft-lb of torque you can use for great cruising or dominating at stoplights. You’ll have instant throttle response and outstanding power you can unleash on demand. With the outstanding power of the Victory Freedom® 106/6 V-Twin, you’ll ride a Hammer 8-Ball with confidence – and with 110 ft-lb of torque on tap. Use the power to enjoy the best cruising, to head out onto the open road, and to manage traffic with passing power to spare. The Victory 6-speed transmission with true overdrive syncs up with the outstanding power of the Victory Freedom® 106/6 V-Twin, and its helical-cut gears ensure that each shift is smooth and sure. When you’re cruising on the interstate, the 6th gear overdrive drops the RPMs and delivers the smooth ride you’ve been looking for. The Hammer 8-Ball features clean, sporty styling. The passenger seat is integrated into the rear bodywork – with a removable gloss black cowl covering the seat. For solo riding, keep the cowl in place and project distinctive muscle cruiser style. To ride 2-up, remove the cowl and share the Hammer 8-Ball experience. The inverted forks enhance the Hammer 8-Ball’s muscle cruiser styling, and provide excellent dampening for easy, intuitive handling and a smooth ride and on every street. This Victory cruiser rolls on a stylish 18” wheel and meaty front tire. Add Victory Accessories and customize your Hammer® to suit your individual style. All Victory accessories undergo the same rigorous testing as our motorcycles, so they install easily, fit properly, and deliver outstanding performance.